If you're anything like me, you've spent the 364 days since last Halloween keeping a meticulous list of potential costumes for this Halloween. And in spite of your efforts, you will still find yourself scrambling to transform your high school gym uniform into something that screams "Nancy Drew" for a party that began 10 minutes ago. To be honest, we could all use an extension on Halloween -- it's just not convenient. Fortunately, the Halloween & Costume Association feels the same way -- and they've started a national petition to formally change the date of Halloween. The Change.org petition, which already has nearly 28,000 signatures (and counting), demands that all Halloween celebrations take place on the last Saturday of October going forward, rather than the 31st. "It's time for a Safer, Longer, Stress-Free Celebration!" the site exclaims. 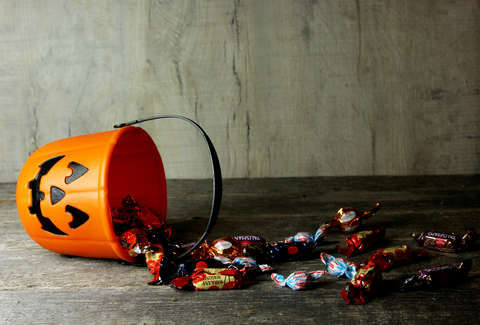 According to the association, 51% of millennials say Halloween is their favorite holiday. There is no citation for this statistic, but regardless of its mathematical accuracy, the sentiment maintains: people like Halloween, so why not give it a full day? The group also claims that there are 38,000 Halloween-related injuries each year, that 70% of parents don't accompany their kids trick or treating, and that 82% of parents don’t use high visibility aids on their kid's costumes -- the last of which makes sense because reflector strips are typically not a seamless addition to an authentic cowboy outfit. Either way, there are safety concerns that accompany sending masked children out alone to ring strangers' doorbells under the cover of darkness. Throughout the comments on the petition, parents enumerate the benefits to a Saturday Halloween: no school the next day, trick or treating during daylight hours, more one-on-one parent-child time, and, as user Nolan Chidester puts it, "Halloween on a Wednesday SUCCKKKKKKKKKKKSSS." That's more of an observation than a benefit, of course. According to the History Channel, Halloween dates backs to Celtic traditions from over 2,000 years ago. On the 31st each year, Celts would light bonfires and don costumes to ward off ghosts and evil spirits. Typically, the holiday fell on this day in particular, as it was "when the boundary between the worlds of the living and the dead became blurred." It remains to be seen whether or not the Halloween & Costume Association will succeed in its efforts to alter the date on which we trick or treat annually, though it's unlikely that any document on Change.org has much say over the boundaries between the worlds of the living and the dead. Eliza Dumais is a news writer at Thrillist who would also like to petition to move her birthday from December to July. Follow her on Twitter.